Twelve Provost’s Awards for outstanding poster presentations are selected from all poster entries shown at the symposium. All winners receive $150. The two interns that were chosen for this award are Zachary Achen and Carlos Paz. Zachary is an undergraduate in Biology. His project is “In Vivo Reprogramming of Muscle cells into an Endoderm Lineage Within the Vertebrate Model,” describes how genetic cell type reprogramming within a patient serves as a potential therapeutic alternative to transplants. However, reprogramming of cells has been restricted to the conversion of ones that are similar in characteristics and origin. We have successfully surpassed this limitation and converted cells to ones that are vastly different in function and origin within a live animal. By using a cocktail of specific DNA regulation factors, we have transformed muscle cells into gut cells within a vertebrate animal model. This proof of principle study demonstrates that change of cell fates with distinct cell origins can be induced in a live animal, thereby expanding the potential applications for cellular reprogramming. 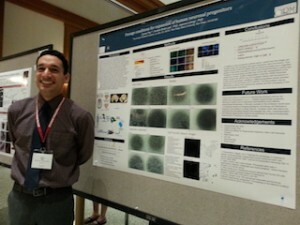 Carlos is an undergraduate in Biochemistry. 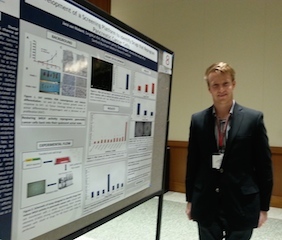 His project, “Passage conditions for expansion of human mid-brain neuronal progenitors” describes how induced pluripotent stem cell (iPSC) research has important potential in remediating diseases where only one cell type is lost. In these cases, iPS cell-based therapy would seek to replace the lost cell type by creating fully pluripotent stem cells from terminally differentiated cells and then re-differentiating to the appropriate cell type, followed by surgical implantation into the therapeutic area. Parkinson’s is a disease amenable to this model, as the symptoms can be traced to the selective degeneration of one specific cell type: midbrain dopaminergic neurons. In the brain, these neurons help coordinate motor function, and once lost there is no known regeneration pathway. Although previous work has established a theoretical framework and some proof-of-concept experiments for cell replacement therapy in humans, an FDA approved therapy will require extensive testing in animals and human clinical trials. This project seeks to streamline the current differentiation protocol in order to increase the efficiency of the experimental timeline and help to bring this therapy to fruition sooner. 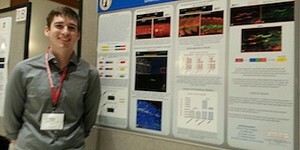 Ten Outstanding Undergraduate Research awards are given for excellence in research. Five poster and five oral presentations are chosen. All winners receive $150. The two interns that were chosen for this award are Jaqulaine Emathinger and Jaco vanNiekerk. Jackie is an undergraduate in Biology. 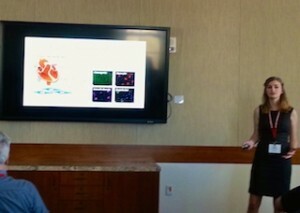 Her project “Rejuvenation of Cardiac Progenitor Cells through PRAS40 mediated inhibition of mTORC1” describes how aging contributes to the progression of heart disease associated with muscle cell and stem cell exhaustion. Cardiac progenitor cells (CPCs)–stem cells within the heart–are particularly sensitive to DNA mutations leading to reduced regenerative potential, which limits their ability to protect the heart after injury. mTOR is a protein which regulates metabolism, survival, proliferation, and growth, which identifies it as an important target for understanding and effecting stem cell function. Addition of an mTOR inhibitor, PRAS40, can improve CPC function and promote cell survival and metabolic maintenance. Jaco is an undergraduate in Biology. His project “Development of a Screening Platform to Identify Drugs that Reprogram Pancreatic Cancer Cells,” describes how patients with Pancreatic Ductal Adenocarcinoma (PDA) have a 73% chance of dying within their first year of diagnosis, thus making it one of the most deadly cancers known. PDA’s poor prognosis warrants a desperate need for further research, understanding, and therapies. Previous studies has shown that PDA arises from digestive enzyme producing acinar cells, and our lab has shown that PDA has an imbalance between two proteins, bHLH transcription factors and their inhibitors. Remarkably, by restoring this balance, we are able to reprogram pancreatic cancer back into a quiescent acinar state. Having found this, we developed a screen that is able to find drugs with the same effect. Current efforts have provided encouraging results and may lead to clinical utility.